So I was selected and hired by the APEFE (Association for the Promotion of the Education and Training Abroad, branch of the French Community of Belgium). I am paid, supported and evaluated by them, but I work, as a dozen other Belgians, with the AUPELF-UREF for the "Bilingual Classes" project. Bilingual classes ? A "delegate" program for the AUF (because not being of higher education nor research) which takes a more and more important dimension. 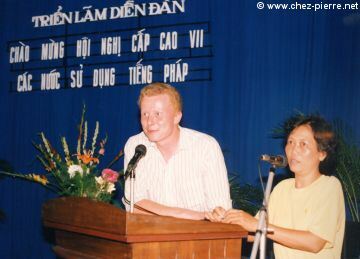 Begun in 1992 by Hervé Fayet (today Project manager for the South-Vietnam) with 6 classes, in 1997 this program touches already more than 500 classes (15 000 pupils) in Vietnam and the project extends in Laos and in Cambodia (as well as Haiti, Vanuatu and Moldavia for the "strengthened French" classes). 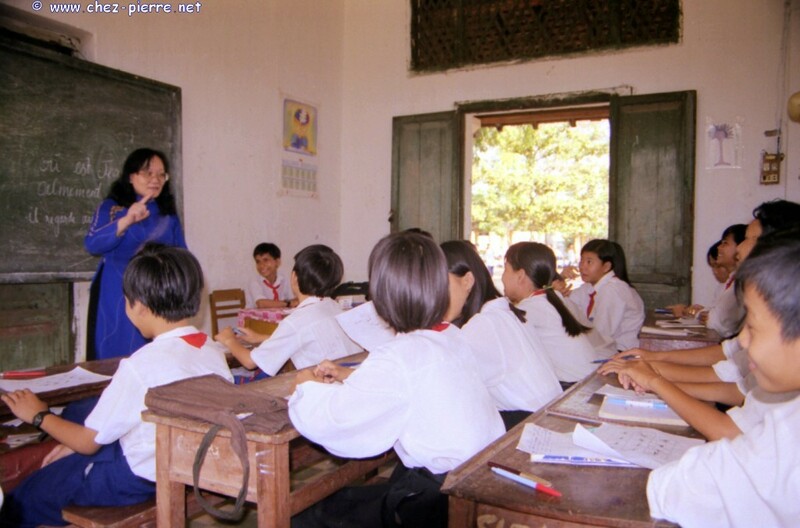 Usually, in Vietnam, children go to school half of the day, notably because there are not enough classrooms to accomodate all the pupils at the same time. But the children of the Bilingual Classes stay all day long and learn all the subjects of the Vietnamese official curriculum, plus about 10 hours of/in French per week. In middle school, the pupils continue with "Ici et Ailleurs", in which were added chapters dedicated to the knowledge of the French-speaking world. 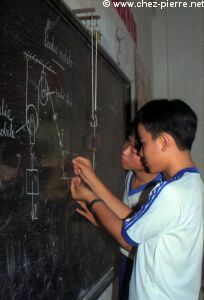 They also have math and physics courses in French, with teachers specialized in these disciplines. 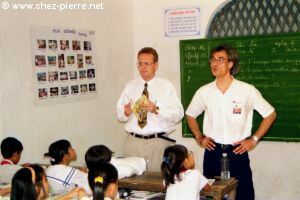 with the method "Tieng Phap" ("French language") ( Hatier). They also have math and physics in French. The demand is strong : the Vietnamese grant a great deal of importance to the education of their children, and if English is attractive, French presents many historic, cultural, scientific and...Material advantages. That's right, the AUF and the APEFE support very intensely this program of the Vietnamese Ministry of the Education and Training by offering numerous equipments (a photocopier for each school, TV, video, tape recorders; textbooks, French-speaking books, etc. ), advantages (the teachers of the bilingual classes are better paid and benefit from a training) as well as the help and the expertise of the foreign administrative and educational personnel. So you can imagine that sometimes, there are more than 500 candidates for the opening of two classes of 30 pupils... This limit of 30 was set to avoid the overpopulation observed in the normal classes (sometimes more than 50 pupils by class). The recruitment is made by "aptitude tests" during the summer, which allow to select the "most capable" pupils. 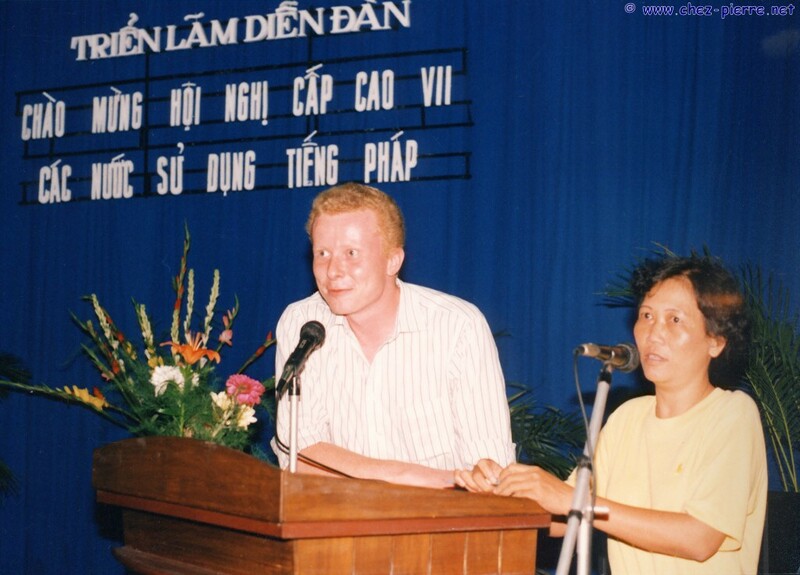 From 1997 till 1998, I handled the 40 bilingual classes of Can Tho , and both classes of Vinh Long (about an hour and a half drive from Can Tho). It represented 38 teachers, about 1100 pupils in 9 schools (for the evolution in 1998-1999, see the next page). My timetable : mainly, visit the classes to observe, help, evaluate, motivate. These visits are almost always followed by an individual meeting for remediation with the teacher. Often, there were activities on the side : invitations, French speakers club, official ceremonies, extracurricular activities, parents's meetings, etc. These almost always took place on Sundays... At 7 o'clock in the morning. Once a month, I had a meeting with the Service of Education of the Province. Once by quarter, we had a national meeting, which grouped all the advisors and both Project managers for a few days. Speeches...quickly become a custom ! Waow... I was very impressed as soon as my first visits (97 in a month). The methods are good and the teachers, for the greater part, use the most modern communicative techniques. The pupils learn well ! They are more disciplined than in Europe (and way more than in the USA !) but a little bit the other way : the biggest problems here are met in the small classes (1st , 2nd). Then, the pupils calm down and auto-discipline themselves. Of course there are exceptions (parents who work all the time and/or neglect their children), but the majority could give us many lessons ! Let's also consider the learning conditions... If the Bilingual Classes are often better provided than the others, the premises are often unsuitable for a quality education. and one sees the results ! My big problems for the job ? At first, the heat. I often leave at 7:00 am from my home, on the motorcycle. 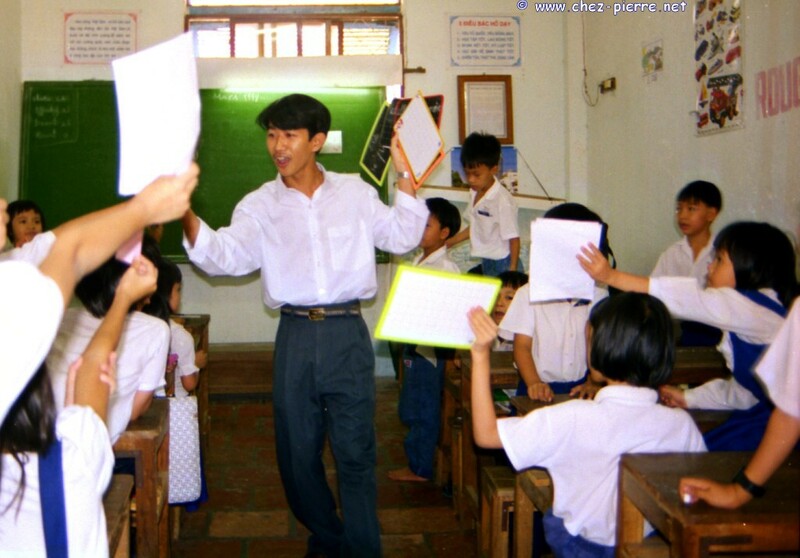 Shirt and trousers are often dipped after 10 minutes in class. In itself it is already (very) annoying, but when I leave after the lesson to work in another school, I expose myself to the wind... I was dipped + wind with the motorcycle = cold ! Regular colds in a city where it's almost never below 25° C, what a joke ! Then, the quantity (of classes, teachers) : that lowers the quality.